A viewer asked how we live. I’ve written about how we planned for our off-grid solar-electric system. From a different angle: here are some of today’s activities preparing for winter. Dry fruit and vegies. My frugal gleaner self picked figs a week ago, and then a new friend gave us a big box of heritage-tree Bartlett pears plus not-quite-ripe apples. 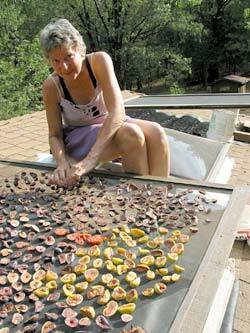 I cut fruit (and cut out plenty of wormy parts), and am drying them up on the roof. Takes less energy and more nutritious than canning, plus no sugar. Hoping these warm days will continue long enough to dry them fully. With our off-grid power, electric dehydrator units are too costly on our electricity budget. Toast almonds in the solar oven. I’d soaked them overnight, now slow-toasting them in the solar oven at a low temperature. Hard-to-find unpasteurized almonds, from a regional farmer. Wash clothes, water the sheet mulch. With the water system problem now solved, we can use water more normally. I’m catching up on extra washing while there’s abundant sun on the photovoltaic panels. I use a discharge hose to send wash and rinse water outdoors to the sheet mulch plot. As the autumn sun moves towards equinox and we get less power each day, I begin to watch the battery levels and for sunny days to wash clothes (slightly more efficient to use the washer while sun is shining on the panels). Clothes drying? Never a timing or resource challenge. Always solar-dried: outdoors in summer, indoors in winter. Water the batteries. Every 6-8 weeks I add distilled water to the bank of golf-cart sized batteries that power the house. Come winter Robyn will be monitoring their capacity. After many gray days we need to run the backup generator to charge them. Store firewood. I’m filling the woodshed with wood cut and split several years ago. Our 1500 square foot house is primarily heated by the woodstove. The propane furnace that came with this manufactured home would use too much in electricity — for fans pushing air through the ducts. And firewood is a renewable resource — probably ten times what we need drops each year within easy access. Cut firewood. Robyn chainsawed some oak limbs into firewood lengths. They’ll get split, and then stacked outside to season for future years’ use. Thinning the forest around the house and along the roadway is a constant practice to create a defensible space in case of fire. So how do we live? Always mindful of, and intimately dancing with, ever-changing resources: sunshine, weather, electrical power capacity, water, food in season, and of course our own time, personal energy, tools and skills. terri alice, thank you. Your recipe is superb. The eggplants melt into the sauce. I used red wine and fresh basil instead (what’s on hand). I think having garlic but not onion adds a rather nice flavor distinctiveness. Definitely a fine way to have eggplant without it being front and center. saute garlic, peppers. add eggplant, olives, capers, tomatoes. eggplant pasta sauce…what’s in it?? caponata? Last week’s CSA eggplants are going for baba ghanouj, but I’m game for what to do with these week’s eggplant! CSA cooking requires adaptability, and probably a host of recipes tuned for them. One of my summertime CSA salads (from Moosewood cookbook) is Alsatian salad: cucumber, tomato, scallion, cheese cubes, fresh basil, tarragon, in a mayo-mustard-sour cream (if you have it) dressing. The tarragon, I think, makes it sing. Smiled while reading about your preparations for winter, because it was so close to ours! We always consider the contents of our CSA box to be an adventure in meal planning. Cathy does most of the cooking, while I plan and plant the vegetable garden. We both do pretty much the rest together. We love eggplant, but when it gets ahead of us, we usually make caponata, and cook up eggplant pasta sauce to freeze.